A new study on microtubules’ dynamics entitled “Theoretical Analysis of Microtubule Dynamics at All Times” was recently published in the Journal of Physical Chemistry B by Xin Li, part of Prof. Anatoly B. Kolomeisky’s group from the Department of Chemistry and Center for Theoretical Biological Physics at Rice University. 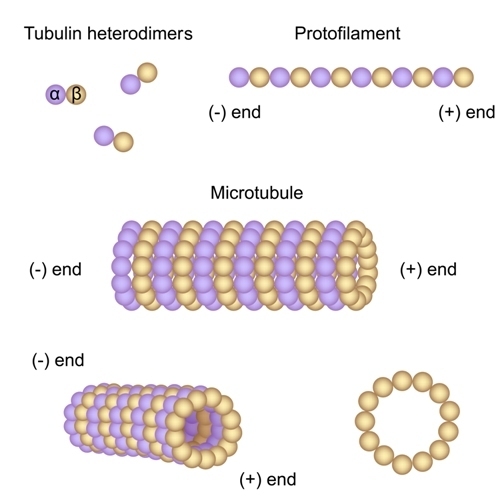 Microtubules are biopolymers formed by subunits of tubulin dimer, the main constituent of cytoskeleton, and are crucial to sustaining the majority of important cellular processes such as cell division, signaling, intracellular transport and cell locomotion. The instability associated with microtubules is crucial for cellular processes. “If the cell stabilizes, it dies,” said Prof. Kolomeisky. Prof. Kolomeisky stated that many drugs bind microtubules to stabilize their growth leading to cell function impairment, a potential way to combat cancer. “The important thing we realized is that the microtubule’s dynamics — how and when it approaches a stationary state — could depend on initial conditions,” said Prof. Kolomeisky. “If you start from a very long polymer seed, it will take longer to reach a stationary state than if you start with a very short seed.” added Prof. Kolomeisky. [adrotate group=”15″]The centrosome, microtubule-organizing center, is the place where seed starts to form. Dimers are constituted by alpha and beta tubulin proteins that form the strands of microtubules. Each dimer binds two molecules of guanosine triphosphate (GTP) and the beta tubulins enables GTP to hydrolyze; i.e. water reacts with GTP that is converted in guanosine diphosphate (GDP). Microtubules are in continuous flux, between states of “catastrophe” (shrinking) or “rescue” (growing), before they are capped to reach their stationary state. The research team established models of single microtubule filaments that predicted when and how unhydrolyzed islands of subunits form. The researchers analyzed seeds that have either all GTP or all GDP subunits. They showed that seeds containing GTP subunits the rate of catastrophes increased with time while seeds with GDP subunits the catastrophes rate decreased over time. Prof. Kolomeisky and Li report the first program to analyze the cytoskeleton, including actin and other fibers, at molecular level to the mechanisms that dictate its behavior. This research was founded by The Welch Foundation, the National Science Foundation and Rice’s Center for Theoretical Biological Physics.